The Private Label PRO Feature allows a user to display customized system messages and deprecate the ShrinkTheWeb logo. Upload your custom system message images, the system will automatically display the messages when appropriate. Add a custom watermark to on all screenshots by entering text and clicking save. • From the section of each available Custom Image type, upload your custom image One Section at a Time. *You can output in any aspect ratio desired - 4:3 default. 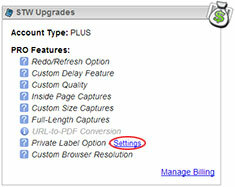 • Select if you want to keep the original image size as well as the custom size.